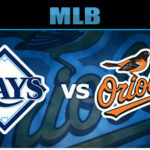 This game will start a three game series between the Baltimore Orioles and the Tampa Bay Rays, which is going to be played at the Tropicana Field. At the time of writing, the first game of the series has not been played yet, so we will look at their stats from the end of their previous series. The Rays are coming into this series from a three game series against the Cincinnati Reds, which they started by losing the first game seven runs to three. In the second and third game, the Rays were able to bounce back, winning both games with one game being close, and the other being really one sided, ending six runs to five and eight runs to five, respectively. The Orioles started their four game series against the Cleveland Indians with an embarrassing 12 – 0 loss, then in the second game they were able to bounce back and get a 6 – 5 win, but in the third they lost 5 – 1. In the last game, they lost 6 – 3, ending the series three games to one. This two teams have had similar seasons, going up and down in the table but being able to complicate the top teams. The Rays have won thirty nine and lost thirty six of their seventy five games in 2017, for a .520 winning percentage that has them in third place of the eastern division of the American League, three games behind league leaders, the New York Yankees, two and a half game behind the Red Sox and only two games ahead of the Baltimore Orioles and the Toronto Blue Jays in fourth place. They have to receive the Orioles with a home record that has been good, having won twenty three and lost sixteen of the thirty nine games they have played at the Tropicana Field, for a .590 winning percentage when playing away from home. The Orioles, on the other side, are not having a bad season, it’s just that their division has been really tough. They have won thirty five and lost thirty seven of their total of seventy one games played, for a .486 winning percentage that has them tied in the fourth place in the eastern division of the American League, with the toronto Blue Jays, five games behind the New York Yankees at the top, but only two and a half games behind the Tampa Bay Rays in third place. They have to visit the Rays at the Tropicana Field, with an away record that has been terrible, having won eleven and lost twenty three of the thirty four games they have played there, for a .324 winning percentage when away from their fans. The Rays are coming from two straight wins, but they have also been able to get six wins in their last ten games. The Orioles, on the other hand, have lost their last two games, and have only been able to win four of their last ten games. Dylan Bundy will be the starter for the Orioles in this game, which will be his sixteenth start of the season. In his previous games, he was able to get seven wins, losing six and leaving two games undecided. He has pitched 92 innings, allowing 83 hits, 39 runs and 13 home runs, for an earned run average of 3.72 and with 65 strikeouts. Jacob Faría will be the start for the Rays in this game, which will be his fourth start of the year. He has gotten three wins, zero losses and leaving no games undecided, while pitching 19.2 innings, allowing 15 hits, 3 runs and 0 home runs, for an ERA of 1.37 and striking out 22 players. We believe the Rays will be able to walk away with this win, with Faría beating Bundy. The total is being set at 9 runs, so we suggest you go with the under.